Please contack boat owners Eriko or Steve at 650-560-9665 or 650-302-0943. Tier 5 Crab Permit, Salmon License, 1 Johnson Pier Retail Sales Permit, 300 crab traps, flatbed, a skiff, boat insurance and all essential gear. Business has been established and profitable for over 2 decades. 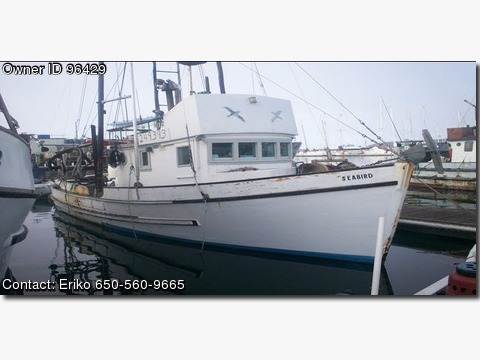 1946 Seabird Fishing Vessel with salmon and crab license and permits This Is A 1946 Seabird Fishing Vessel Being Sold With a Dungeness Crab King Salmon And Halibut Fishing Business US Coast Guard documented 35.6 overall 39 feet Tier 5 Crab Permit Salmon License 1 Johnson Pier Dock Sale Permit all essential gear 300 crab traps. The Boat Is Old But Faithful, Always Giving What Is Asked Of Her, Have All Coast Guard Documentation, Is 39 Feet, Tier 5 Crab Permit, Salmon License 1 Johnson Pier Dock Sale Permit, All Essential Gear, 300 Crab Traps, Flatbed And Trailers, a Skiff, Boat Insurance and More. Flatbed truck with flat trailers 90 crab pods on truck and 70 pods on the trailer go at once Crab block including extra pump x 3 worthwhile 5000.00 Salmon x 3 worthwhile 5K, Extra diesel stove Live receiver tanks on top of built in tank 20 to keep products live Extra buoys and rope The owner can coach and consult the business after the sale closure 1-Coach, 2-Run the boat To Be Discussed Financing, Nationwide Shipping And Warranties Available To Qualified Buyers Stock Number:B82654T Boat Details Type:Power Boat Condition:Good Length:39 Hull Material:Wood Exterior Color:White Interior Color:White Engine Type:Single Horsepower:90 Engine Hours:6,000 Engine Mfg. :Detroit diesel No.